Having a well-trained sales team is like having insurance for your advertising dollars. Your marketing efforts capture the attention of buyers. The sales team converts those efforts into closed sales and satisfied clients. They are where the rubber truly meets the road in the auto industry. 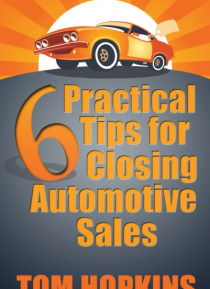 Implement the six tips in this e-book and watch as the confidence level of your team increases right along w… ith your revenues.A few of the areas covered in this e-book include:How to plan activities that lead to productivity.Ways to help potential buyers like you, trust you and listen to your advice in answer to their vehicle needs.Questions to ask to determine quickly if buyers are qualified or just dreamers.How to move from the presentation to having closed sales.